American test engineer mission specialist astronaut 1978-1990. Author of the frankest astronaut biography ever published. Flew 150 combat missions in Vietnam. Status: Inactive; Active 1978-1990. Born: 1945-09-10. Spaceflights: 3 . Total time in space: 14.85 days. Birth Place: Wichita Falls, Texas. Nicknamed Tarzan to Hawley's Cheetah after the duos infamously fawning encounter with Bo Derek during the filming of Tarzan the Ape Man. PERSONAL DATA: Born September 10, 1945, in Wichita Falls, Texas, but considers Albuquerque, New Mexico, to be his hometown. Married to the former Donna Marie Sei of Albuquerque, New Mexico. They have three grown children. Recreational interests include backpacking, skiing, and running. EDUCATION: Graduated from St. Pius X Catholic High School, Albuquerque, New Mexico, in 1963; received a bachelor of science degree in Military Engineering from the United States Military Academy in 1967; and awarded a master of science degree in Aeronautical Engineering from the Air Force Institute of Technology in 1975. SPECIAL HONORS: Awarded 6 Air Medals, the Air Force Distinguished Flying Cross, Meritorious Service Medal, Vietnam Campaign Medal, National Defense Service Medal, Vietnam Service Medal, and Air Force Commendation Medal, and NASA Space Flight Medal; named a Distinguished Graduate of the USAF Navigator Training School (and recipient of its Commander's Trophy), the USAF Institute of Technology; and the USAF Test Pilot School. EXPERIENCE: Mullane, an Air Force Colonel, was graduated from West Point in 1967. He completed 150 combat missions as an RF-4C weapon system operator while stationed at Tan Son Nhut Air Base, Vietnam, from January to November 1969. He subsequently served a 4-year tour of duty in England. In July 1976, upon completing the USAF Flight Test Engineering Course at Edwards Air Force Base, California, he was assigned as a flight test weapon system operator to the 3246th Test Wing at Eglin Air Force Base, Florida. NASA EXPERIENCE: Selected by NASA in January 1978, Mullane became an astronaut in August 1979. A veteran of three space flights, he has logged a total of 356 hours in space. He was a mission specialist on the crew of STS-41D (August 30 to September 5, 1984), STS-27 (December 2-6, 1988), and STS-36 in (February 28 to March 4, 1990). Colonel Mullane retired from NASA and the USAF in September 1990. He is self-employed as a professional speaker & writer and resides in Albuquerque, NM. His first novel, Red Sky, A Novel of Love, Space, & War was published in June 1993 by Northwest Publishing, Inc. of Salt Lake City, UT. SPACE FLIGHT EXPERIENCE: STS-41D Discovery, launched from Kennedy Space Center, Florida, on August 30, 1984. This was the maiden flight of the Orbiter Discovery. During this 7-day mission the crew successfully activated the OAST-1 solar cell wing experiment, deployed three satellites, operated the CFES-III experiment, the student crystal growth experiment, and photography experiments using the IMAX motion picture camera. STS-41D completed 96 orbits of the earth in 145 hours before landing at Edwards Air Force Base, California, on September 5, 1984. STS-27 Atlantis, launched from Kennedy Space Center, Florida, on December 2, 1988. The mission carried a DOD payload, as well as a number of secondary payloads. After 68 orbits of the earth, the mission concluded with a dry lakebed landing on Runway 17 at Edwards Air Force Base, California, on December 6, 1988. Mission duration was 105 hours. STS-36 Atlantis, launched from the Kennedy Space Center, Florida, on February 28, 1990. This mission carried Department of Defense payloads together with a number of secondary payloads. After 72 orbits of the earth, the STS-36 mission concluded with a lakebed landing at Edwards Air Force Base, California, on March 4, 1990. BIRTHPLACE AND DATE: Born September 10, 1945, in Wichita Falls, Texas, but considers Albuquerque, New Mexico, to be his hometown. His mother, Mrs. Hugh J. Mullane, resides in Albuquerque; his father is deceased. PHYSICAL DESCRIPTION: Gray hair; brown eyes; height: 5 feet 10 inches; weight: 150 pounds. MARITAL STATUS: Married to the former Donna Marie Sei of Albuquerque, New Mexico, daughter of the late Mr. and Mrs. Joseph J. Sei. CHILDREN: Patrick Joseph and Amy Michele, March 5, 1968; Laura Ann, February 19, 1971. RECREATIONAL INTERESTS: He enjoys backpacking, skiing, and running. ORGANIZATIONS: Member of the Air Force Association. SPECIAL HONORS: Awarded 6 Air Medals, the Air Force Distinguished Flying Cross, Meritorious Service Medal, Vietnam Campaign Medal, National Defense Service Medal, Vietnam Service Medal, and Air Force Commendation Medal, and NASA Space Flight Medal; named a Distinguished Graduate of the USAF Navigator Training School (and recipient of its Commander's Trophy), the USAF Institute of Technology, and the USAF Test Pilot School. EXPERIENCE: Mullane, an Air Force Colonel, was graduated from West Point in 1967. He completed 150 combat missions as an RF-4C weapon system operator while stationed at Tan Son Nhut Air Base, Vietnam, from January to November 1969. He subsequently served a 4-year tour of duty, in England. In July 1976, upon completing the USAF Flight Test Engineer Course at Edwards Air Force Base, California, he was assigned as a flight test weapon system operator to the 3246th Test Wing at Eglin Air Force Base, Florida. NASA EXPERIENCE: Selected by NASA in January 1978, Mullane became an astronaut in August 1979. 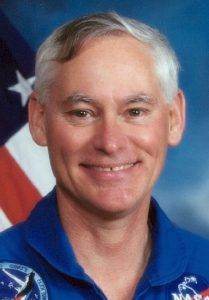 He has flown on three Space Shuttle missions, serving as a mission specialist on the crew of STS 41-D Florida in August 1984, on STS-27 in December 1988, and on STS-36 in March 1990. On his first mission Mullane served on the crew of STS-41 which launched from Kennedy Space Center, Florida, on August 30, 1984. This was the maiden flight of the Orbiter Discovery. During this 7-day mission the crew successfully activated the OAST-1 solar cell wing experiment, deployed three satellites, operated the CFES-III experiment, the student crystal growth experiment, and photography experiments using the IMAX motion picture camera. STS 41-D completed 96 orbits of the earth in 145 hours before landing at Edwards Air Force Base, California, on September 5, 1984. Mullane then flew aboard the Orbiter Atlantis, on STS-27, which launched from Kennedy Space Center, Florida, on December 2, 1988. The mission carried a DOD payload, as well as a number of secondary payloads. After 68 orbits of the earth, the mission concluded with a dry lakebed landing on Runway 17 at Edwards Air Force Base, California, on December 6, 1988. Mission duration was 105 hours. On his third flight, Mullane served on the crew of STS-36 which launched from the Kennedy Space Center, Florida, on February 28, 1990, aboard the Space Shuttle Atlantis. This mission carried Department of Defense payloads and a number of secondary payloads. After 72 orbits of the earth, the STS-36 mission concluded with a lakebed landing at Edwards Air Force Base, California, on March 4, 1990. With the completion of his third flight, Mullane has logged a total of 356 hours in space. Col. Mullane has announced his intention to retire from NASA and the Air Force, effective August 1, 1990, and plans to return to his hometown of Albuquerque, New Mexico. Departed Date: 1990-08-01. Marital Status: Married. Children: Three children. Childhood: Grew up in Albuquerque, New Mexico.. Education: West Point;AFIT;Edwards. Family: Astronaut. Country: USA. Flights: STS-12, STS-41-D, STS-62-A, STS-27, STS-36. Projects: STS. Agency: USAF. Bibliography: 12, 4457, 5810. 1945 September 10 - . Birth of Richard Michael 'Mike' Mullane - . Nation: USA. Related Persons: Mullane. American test engineer mission specialist astronaut 1978-1990. Author of the frankest astronaut biography ever published. Flew 150 combat missions in Vietnam. 3 spaceflights, 14.8 days in space. Flew to orbit on STS-41D (1984), STS-27, STS-36..